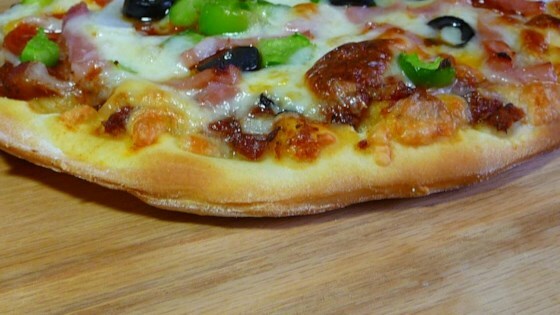 "A really wet, sticky pizza dough that bakes up to perfection! Simple ingredients and technique in this dough make your pizza crust authentic, crispy and chewy just like your favorite NY brick oven joint. This recipe makes enough for three 10- to 12-inch pizzas, two 12- to 14-inch pizzas, one 16- to 18-inch pizza, or 6 to 8 small single serving stromboli." Pour the warm water into the pan of a bread machine, sprinkle in the salt, and add the flour to the pan so the flour sits on top of the water. Make a hole in the top of the flour, and spoon the yeast into the hole. Let the mixture sit for 20 minutes to moisten the flour. Set the bread machine to the knead setting, and knead the dough for about 10 minutes. Turn the dough out onto a floured surface, and knead in 1/4 cup more flour or as needed, adding the flour about 2 tablespoons at a time, to make a wet, sticky, but elastic dough. The dough should be "as soft as a baby's bottom." Form the dough into a round shape. Wipe the inside of a large bowl with olive oil, and place the round ball of dough into the bowl. Turn the dough over a couple of times so the dough picks up a thin coating of oil. Cover with a cloth, and refrigerate the dough for 10 hours or overnight. The next day, allow the dough to come to room temperature before rolling out on a floured surface and adding toppings as desired. Roll the dough out thin with a thicker edge before adding toppings. Place a pizza stone into oven, dust it with a little flour, and preheat oven to 500 degrees F (260 degrees C). Bake the pizza on the stone in the preheated oven until the bottom of the crust is browned, 6 to 8 minutes. This dough can be made in a bread machine on the quick dough cycle if you prefer. If you do it in a bowl, you really need a dough mixer because this dough will be, and remain, pretty sticky, and it's impossible to work with it with your hands. It's important for the crust texture that it be a very soft, wet dough. This is delicious! it made the Breakfast Pizza from All Recipes taste amazing. both times I made it with this dough, it didn't last past dinner time. The best pizza dough I've tried so far. It's soft, chewy, and shapes greatly. You will easily get thinner, crispier bottom but chewy and soft edge!